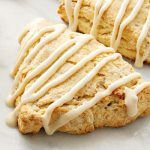 This Spiced Eggnog Scones recipe is perfect for enjoying during the Christmas season with a cup of coffee or tea. Not only is eggnog baked right inside of this holiday scone, but the top has a delicious eggnog drizzle. So good! If there is one drink that says Christmas, it would have to be eggnog. Whether you make it homemade or buy it already made at the grocery store, enjoy it spiked or non-alcoholic, it’s one of the most popular drinks during holiday gatherings. You may also enjoy the flavor of eggnog in some of your favorite treats. Eggnog is also excellent for adding holiday flavor to baked goods, breakfast recipes, or even to add to other drinks such as coffee or tea. One of our most popular holiday recipes here on our blog is our Eggnog Biscotti recipe. It’s a crispy Italian cookie with eggnog baked right into the cookie and used in the glaze. They are delicious with a cup of coffee, unique for trading in holiday cookie exchanges, and their sturdiness makes that ideal for shipping to loved ones. A less “sturdy” treat — but equally delicious — is what we’re sharing today: Spiced Eggnog Scones recipe. Scones are a type of quick bread, baked in individual servings. They are usually a bit sweet and often have a glaze. They also tend to be a bit delicate and “crumbly” for lack of a better word. While their texture is more like a biscuit than a muffin, we consider them to be more of an alternative to muffins. 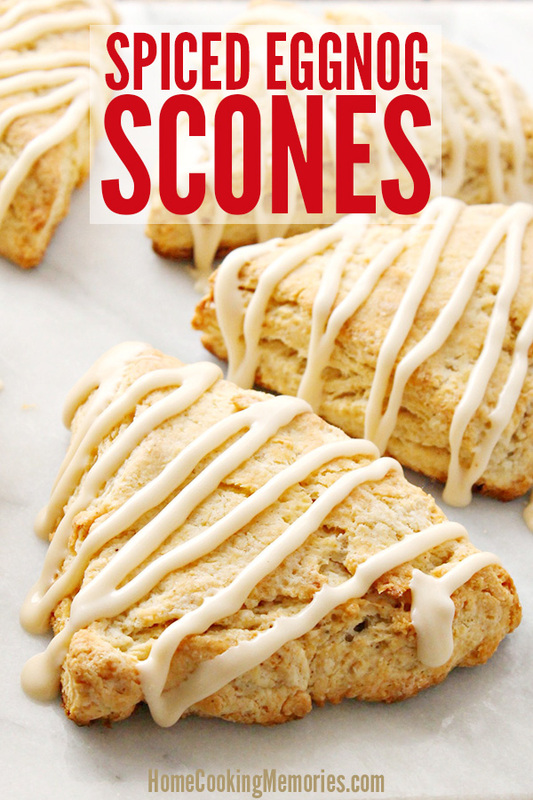 We really like scones with great with coffee or tea, for enjoying as a breakfast or a snack. 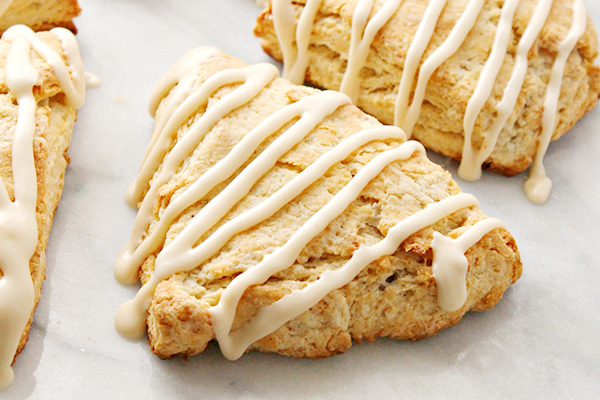 This Spiced Eggnog Scones recipe is perfect for enjoying during the holidays. 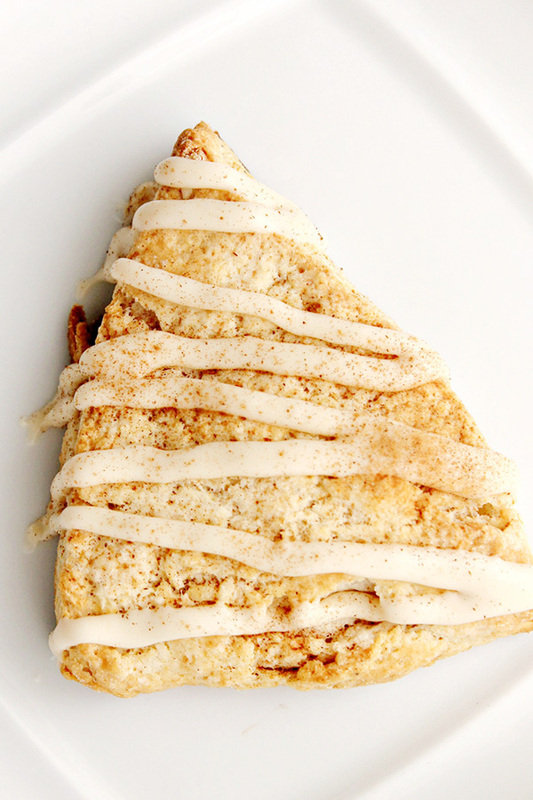 Not only is eggnog baked right inside of the scone, but the top has a delicious eggnog drizzle. 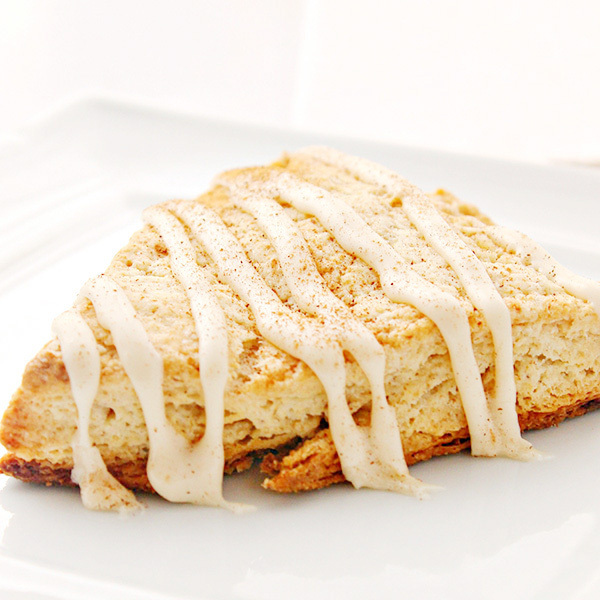 Making these Spiced Eggnog Scones is quite simple. You’ll first combine the ingredients to make a dough. Then, you’ll shape the dough into a 1″ thick circle. Before baking, you’ll cut the dough into 6 or 8 wedges, depending on how large you want each scone to be. Then, they are baked and then cooled before drizzle with an eggnog glaze. So good! Here’s the full recipe, ready for you to print. Not ready for it yet? 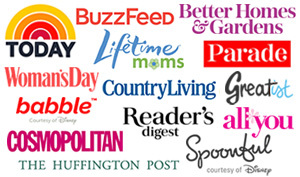 We’d love for you to save to your Christmas board on Pinterest or share to your Facebook wall. Preheat the oven to 400ºF. In a large mixing bowl, combine the flour, salt, cinnamon, nutmeg, baking powder, and sugar. Add the cubes of butter to the dry ingredients and cut in the butter with two butter knives, your hands, or a pastry cutter until only pea-sized pieces of butter remain. In a separate bowl combine the eggnog, egg, sour cream, and vanilla. Whisk together with a fork, and pour the wet ingredients mixture over the dry ingredients and mix with spatula or spoon until most of the way combined, then use your hands to knead the dough a few times to finish mixing it. Cut the dough into 6 or 8 triangles and pull them back from each other on the baking sheet to give them room to rise as they bake. Bake for 20-25 minutes. In a small bowl, mix together the powdered sugar, eggnog, and vanilla until smooth. Drizzle generously over the scones. Dust with cinnamon. Store the scones in an airtight container. 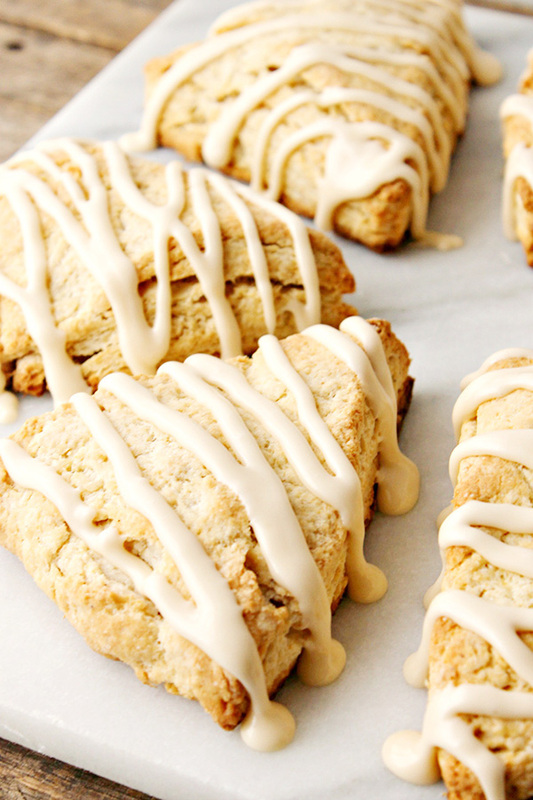 I love your Spiced Eggnog Scones! Hope you have a great week and thanks so much for sharing with us at Full Plate Thursday. I am imagining these wrapped in a fancy, festive food wrapper or box – so beautiful! These sound so good, too! Thanks for sharing at Fiesta Friday party! We always have eggnog AND scones on Christmas morning! This is perfect!